In case you missed the announcement (from Chicago's own Frontera Grill) earlier this week, the James Beard Foundation, the nation's most prestigious recognition program honoring professionals in the food and beverage industries, announced the nominees for the 2009 James Beard Foundation Awards. Susan Ungaro, James Beard Foundation President, hosted an invitation-only breakfast at JBF Award-winning chef Rick Bayless' and JBF Trustee Deann Bayless' highly-acclaimed Frontera Grill, where nominees in 52 categories were announced in the Foundation's various awards programs -- Restaurant and Chef, Book, Journalism, Design and Graphics, and Broadcast Media. Honorees in a number of special achievement awards, including Who's Who of Food & Beverage in America, Lifetime Achievement, Humanitarian of the Year, and America's Classics, were announced as well. For the complete list of nominees, please visit www.JBFAwards.com. Winners of the Restaurant and Chef, Book, Design and Graphics, and special achievement awards will be celebrated at the highly-anticipated annual Awards Ceremony and Gala Reception, taking place on Monday, May 4, 2009 at Lincoln Center's Avery Fisher Hall. The Awards Ceremony and Gala Reception are open to the general public, and tickets can be purchased by calling the Awards Box Office at 212.925.0054 or by visiting www.JBFAwards.com. General public tickets are $450, but the James Beard Foundation is offering an "Early Bird Special" $50 ticket buyer discount from March 23rd - April 4th. The Journalism and Broadcast Media Awards will be presented at the invitation-only Media Awards Dinner on Sunday, May 3, 2009 at the Hudson Theatre in midtown Manhattan. 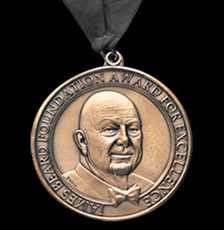 All award winners will receive a certificate and a bronze medallion engraved with the James Beard Foundation Awards insignia. There are no cash awards. Established in 1990, the James Beard Foundation Awards recognize culinary professionals for excellence and achievement in their fields and continue to emphasize the Foundation's mission: to celebrate, preserve, and nurture America's culinary heritage and diversity. The 2009 James Beard Foundation Awards will celebrate Women in Food. A highlight of the May 4th festivities will be the Gala Reception, which will take place following the Awards Ceremony at Avery Fisher Hall, featuring a line-up of some of America's most noteworthy female chefs, sommeliers, mixologists and artisanal producers. Lidia Matticchio Bastianich, acclaimed chef, restaurateur, television personality, cookbook author and multiple James Beard Foundation Award-winner, will serve as the honorary Gala Chair. As Gala Chair, Ms. Bastianich will work with the Awards Committee in the menu selection of the culinary talents featured at the Gala Reception. The 2009 James Beard Foundation Awards are presented in association with All-Clad Metalcrafters and American Express(R) (the official card of the James Beard Foundation); Premier Sponsors: Green & Black's(R) Organic Chocolate, Lexus, Viking Range Corporation; Supporting Sponsors: Delta Air Lines, illy caffe North America, Inc., Southern Wine & Spirits of New York, Stella Artois; Gala Reception Sponsors: Acqua Panna(R) Natural Spring Water, Ecolab, Pernod Ricard USA, Rums of Puerto Rico, S.Pellegrino(R) Sparkling Natural Mineral Water; and with additional support from Chefwear and Pommery Champagne. Want to attend the party? The fabulous James Beard Award celebration on May 4 carries at hefty ticket price of $400 but if you act fast, you can take advantage of the Foundation's $50 discount for tickets purchased by April 4, go to http://www.jbfawards.com/JBFform.html for information and reservations. The James Beard Foundation is dedicated to celebrating, preserving, and nurturing America's culinary heritage and diversity in order to elevate the appreciation of our culinary excellence. A cookbook author and teacher with an encyclopedic knowledge about food, James Beard, who died in 1985, was a champion of American cuisine. He helped educate and mentor generations of professional chefs and food enthusiasts. Today, the Beard Foundation continues in the same spirit by administering a number of diverse programs that include educational initiatives, food industry awards, scholarships to culinary schools, and publications, and by maintaining the historic James Beard House in New York City's Greenwich Village as a performance space for visiting chefs. For more information, please visit www.jamesbeard.org.